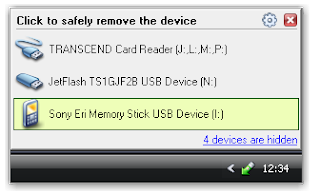 USB Safely Remove is a comfortable and safe replacement for the standard "Safely Remove Hardware" tool. The program has many features designed for effortless working with hotplug devices (USB, SATA and FireWire). What makes USB Safely Remove better than the Windows 'Safely Remove Hardware' tool? - The ability to hide any device from the 'stop' menu. - Uses real device names and allows renaming. - Keyboard shortcuts for easy device stopping. - Unique menu for one-click stop. - Programs autorun on device plugging/unplugging. - It tells you why a device cannot be stopped immediately. Dead link plz update it.